Information on plant endemic to Namibia and one of the most characteristic plants of the Namib Desert. The names: Acanthosicyos horridos (scientific), Buterpits (English), Botterpitte Narras (Afrikaans), Nara (German), !Nara (Nama). 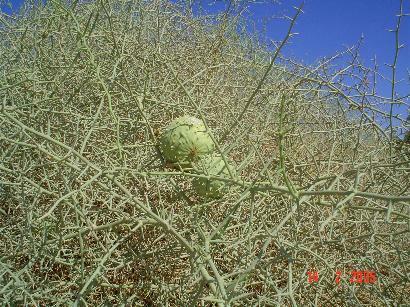 Description: Leafless bush (prevention of evapo-transpiration and defence against browsers), longitudinally grooved stems, which shrink in drought, 2-3 cm long, paired, straight, sharp spines, roots up to 30 cm in diameter, reach to depth of 40 m, male and female flowers on separate plants, flowers: greenish-yellow, 3 cm in diameter, female flower is easy to recognise by swollen base which turns into fruit, photosynthesis occurs in green spines, stems and flowers, fruit: green, melon-shaped with thorny protuberances, size of baby's head, pulp: orange-yellow, protein and iron rich, seeds: cream coloured, consist of 57% oil and 31% protein, tastes like nuts (was exporting to Cape Town as a nut as early as 1877). The Nara bush is endemic to coastal Namib, grows only within reach of subterranean water, forms high dunes by trapping sand. The plant is believed to be in existence for more than 1000 years. The Nara is a member of the cucumber family and grows in sandy areas and along river beds. The Nara bush is eaten by: giraffe, Oryx, rhino, jackal, hyena, gerbils, beetles. The Topnaar people feed their donkeys and goats with Nara peels and their chicken with seeds. Human use: harvested from November to May, peeled, boiled for several hours which releases seeds from pulp. sieving to separate seeds from pulp, seeds dried in the sun and stored in bags, seeds eaten like nuts or grounded with other dishes, boiled pulp is poured on sand or on bags and left to dry in the sun for several days - these flat cakes can be stored for years as a valuable source of food. Fresh fruit: can be eaten raw as a substitute for water in drought, has a pleasant fruity taste, peeled seeds can be eaten raw or roasted. Medical use: fresh pulp relieves stomach ache, decoction of roots used as ''life-elixir'' to cure internal diseases, crushed roots mixed with an oil is smeared on wounds to fasten healing, oil from raw or roasted seeds used to moisturise skin and serves as protection against the sun.